From Dalaman International Airport guests should drive to Gokova. From Gokova Square turn off towards Marmaris and the hotel is just 2.5 km from Marmaris city centre. 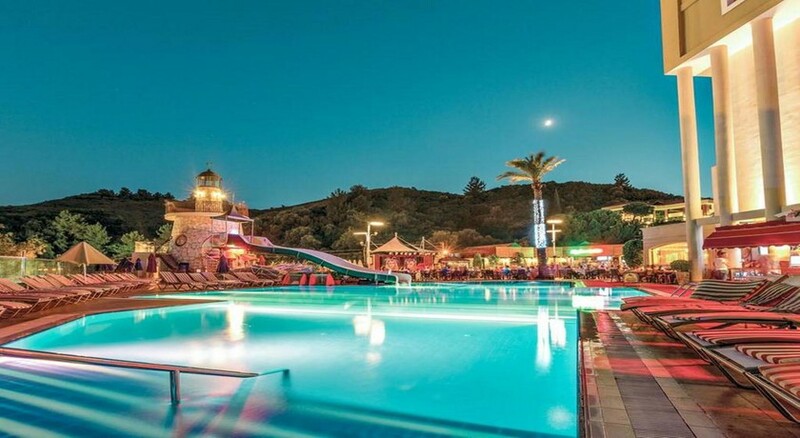 This family friendly club resort is ideal for holidaymakers and business travellers alike. It comprises a total of 244 rooms including 161 standard rooms, 2 disability friendly rooms, 2 connecting rooms, 20 family rooms, 4 deluxe family apartments, 1 presidential suite, 1 grand suite, 2 senior suites, 1 junior suite and 54 apartments. This establishment provides a relaxing, friendly and lively atmosphere with bright and modern dï¿½cor, excellent accommodation, service and facilities. 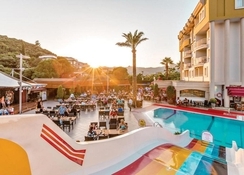 These include a selection of fine restaurants and bars, air conditioning, a lobby area with a 24-hour reception, a currency exchange facility, 3 lifts, a hairdresser, a pub, a games room, a TV lounge, Internet access, conference facilities, room and laundry services (charges apply to both) and parking. 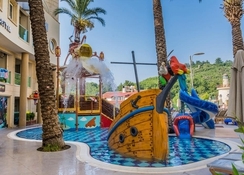 In addition the hotel offers a kids' club and a playground. It is the perfect choice for couples and families of all ages.